John Craigie recorded his most recent album, No Rain, No Rose, in his Southeast Portland living room with some of his closest friends and musical acquaintances. Picture it – a big, white Victorian-era house with a wrap around porch full of people in flannels and vests, with beards and thick-rimmed glasses, giving hugs and shoulder rubs. In good Portland spirit, this experience was as much a recording session as it was a gathering centered on a cooperative and communal desire to create something for everyone. “It was basically a big hangout that resulted in an album,” he said laughing. The goal – to get a group together and make an album that reflected the music they make after shows and in their free time. Something natural and flowing. This is reflected on the album cover, where Craigie and his collaborators sit in a mock living room set out front of the house, appearing laidback and comfortable. “After a show, we’re all in someone’s living room, we’re all just playing each other’s [songs] and everyone feels really good. So I wanted to kind of capture that. So for that album, I just got everyone over to the house that I live in, I had it set up by a great engineer, all rigged up with a few mics, and some cool ambiance, and we just played in that style,” he said in a Swallow Hill Music interview published on their website late last year. But Craigie hasn’t always made music in this environment. In fact, he is a Portland transplant from L.A., where he was raised and spent his formative years thru college. He picked up a guitar for the first time at the age of 16 and moved to Santa Cruz at 18 where he became at KPIG-FM, a radio station that features disc jockeys who are allowed to create their own playlists and focuses on blues, folk, Americana and alternative. It was at this time in Craigie’s life that he was drawn to the sounds that had the heaviest impact on his personal style. It was also at this time when he planted the seed of making a career as a guy with a guitar and a story to tell, he said. After nearly a decade spent on the road in true travelling troubadour style, Craigie settled, somewhat, in Portland five years ago. His close friends, the Shook Twins, had been living there for some time and he often stayed with them, so it was something of a natural transition into the city. He recalls this time as the height of Portlandia, when the city was really nesting into its weird, artsy, alternative, whatever you want to call it, identity. Not long after this move, Craigie heard from none other than Jack Johnson, who had been listening to Craigie’s Capricorn in Retrograde… just kidding… Live in Portland (2016) album, and expressed interest in bringing Craigie on to accompany him for a handful of his summer 2017 shows. From Johnson, Craigie said he learned important lessons in dealing with the influx of fame, managing a team, how to handle stadium shows, and also in generosity. The two put out a live duet, “I Wrote Mr. Tambourine Man” last year, the proceeds of which go to Johnson’s All At Once charity that aims to help fans make positive changes in their local and global communities. 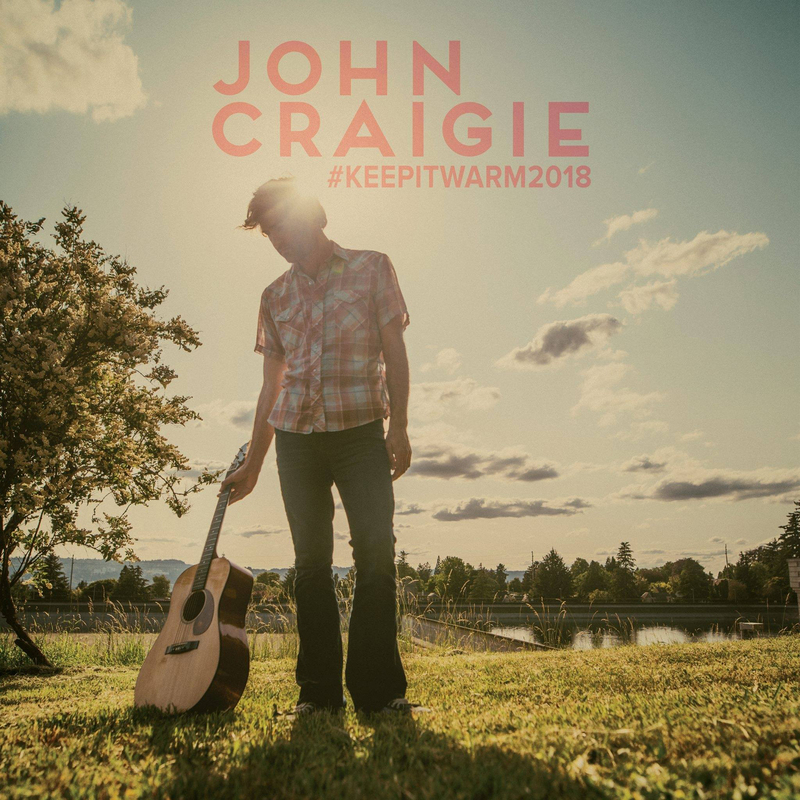 Too, on Craigie’s upcoming #Keepitwarm tour (where he will stop at The Firefly in Bellingham on Dec. 1), $1 from each ticket sold will be donated to a local non-profit. They’ll also be collecting new/gently used sleeping bags, jackets, gloves, hats, scarves, socks, etc. at the shows. All who donate will receive a free signed poster. A special email list will also be available to those that donate and two winners will be chosen from each show to receive a Craigie merch bundle that includes a t-shirt, signed CDs and signed vinyl. And in this sense, Craigie is staying true to his roots; to making people feel comfortable, whether it be recording in his living room, attending his live shows, or even by not knowing him at all, but receiving the donations from his work. John Craigie plays The Firefly on Dec. 1. For more information and updates, see Craigie’s social media.